It's that time again! Let's take a look at what happened to some people who were caught in highsec without a New Order permit during the week of July 28th @ 00:00 EVEtime through August 3rd @ 23:59 EVEtime. Spacey Smurf, like so many other carebears, didn't spend much time on his mining ship's tank. He fit for yield instead. Or did he? No, he dropped one of the two highslots available for mining lasers, in favor of a salvager. Then Agent Gaylord Fappington showed up, and suddenly it was the wreck of Spacey Smurf's Retriever that needed salvaging! 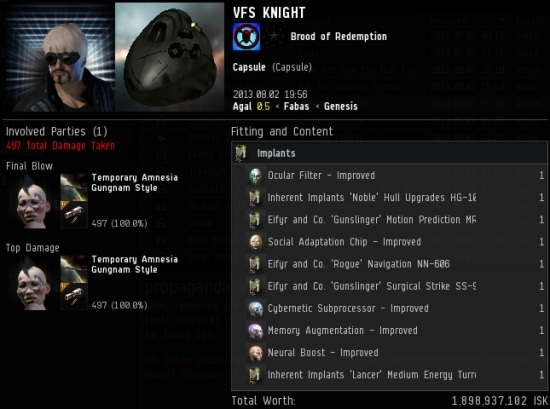 The pod of the week goes to VFS KNIGHT's 1.9 billion isk pod. KNIGHT learned what a real Knight is when Agent Temporary Amnesia destroyed his Hulk and sent him home on the pod express. 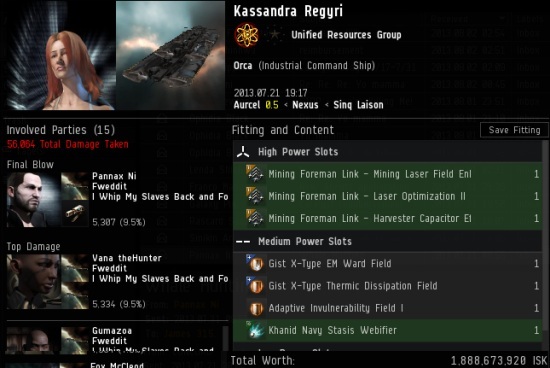 It wasn't from this week, but Kassandra Regyri's 1.8 billion isk Orca loss probably still stings--along with the 1.8 billion isk pod. 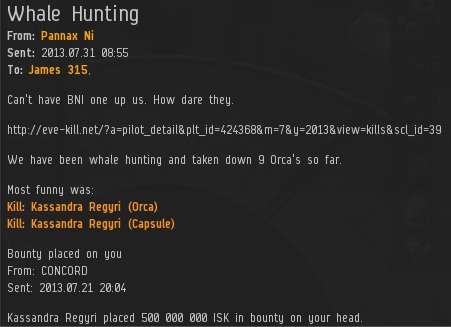 Pannax Ni is what we call "favored by the stars": He got the killing blow on the Orca and got the pod. 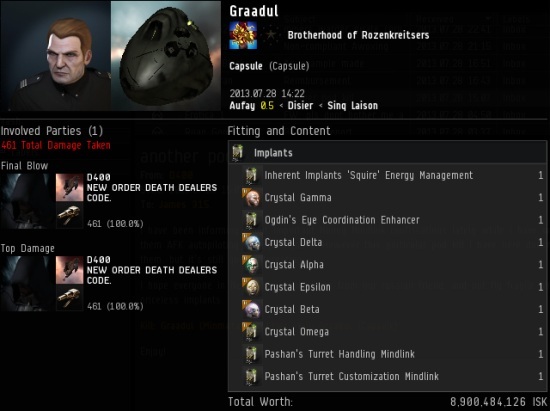 Meanwhile, Agent Ophidia Black alerted me to the death of Michael Geezy's 434 million isk Venture, killed courtesy of Dana Walker. 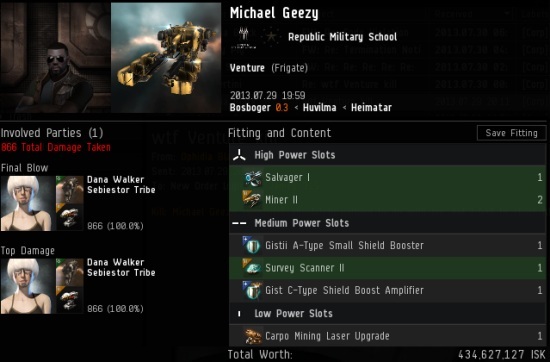 Though a lowsec kill, Geezy's abomination could point toward a trend of bot-aspirant Venture pilots. Be on your guard, Agents. Feast your eyes. It's not the pod of the week; it's the pod of the century. You know, we in the New Order are a generous bunch. We own highsec, but we're willing to share. We've withheld nothing. We let people jump through our stargates, dock in our stations, and mine in our systems. We only ask that you follow our rules, show respect to our Agents, and pay 10 million isk for a permit. If you refuse, you have no one to blame but yourself for the consequences. I heard someone in fleet talking about D400's podkill the other day here in Fountain, I was all like, "I KNOW THAT GUY!!" Hey there Anon, hate clouds the mind my friend, as you have so eloquently demonstrated. Relax for a second... take a breath... and another... relax. Now then, are you sure it was an Ares? Feel free to post a correction and please, no need to thank me, I am here to help! lol gloating over a single kill. 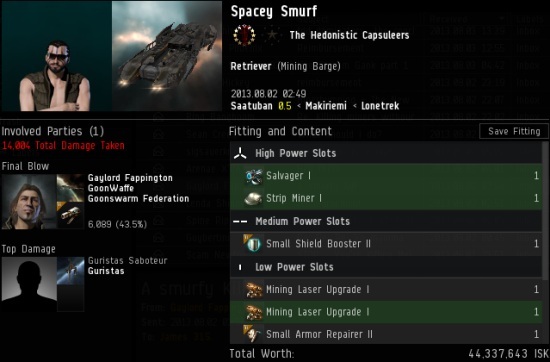 must be a true carebear, because anybody who actually plays eve knows kills (especially on cheap stuff like interceptors) are a dime a dozen. That pod was the perfect symbol of carebear excess and complacency... destroyed in a single volley. VICTORY!!!!!!!!!! Were any tears generated by that podding? D400 does this ALL the time! Truly a seasoned veteran of sensing capsules of value. Things in EVE belongs to the ones strong enough to hold control over them, little one. You want to mine but you can't. The NPC empires can't help you. So think about it: who owns the place you want to mine in? If you're to weak-minded to accept or overcome this, then you're not EVE material. And writing words with ALL CAPS doesn't make them any less false. It ain't bragging if you can actually do it. Agents pay the Iron Price for what they take. There is no higher authority than greater force.